A-LIST celebrities are not the only jetsetters swooping into Ibiza aboard private planes. Longstanding visitors Kate Moss, Naomi Campbell and Paris Hilton will be in good company as airport execs forecast a surge of up to 120 private jets landing per day this summer. 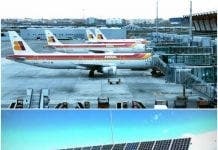 And to cater for soaring demand, AENA has recently approved an extension of the private jet runway to 80,000m2. It will accommodate 58 planes, including 34 jets. Currently there is only landing room for 25 jets of 18-metre wingspan. The demand is real for Ibiza’s main airport, Eivissa, which experiences anything from 80 to 120 planes coming and going each day during July and August, with the highest number at weekends. And with Spain’s most expensive property La Fortaleza (worth €30 million) featuring in UK series The Night Watchman, high-flying visitors will continue to flock in. A one-way ticket from London to Ibiza can fetch as much as €25,500 one way while an economy ticket with British airways costs around €65.